Full embassy legalisation with the Kuwait Embassy in London. We provide both the apostille and the embassy stamps. You send us the document and we take care of the complete service from start to finish. Need help getting your academic or personal papers legalised for use in Kuwait? We are experts in attesting documents. We make sure your documents are correctly issued with both the UK apostille certificate and the stamps of the embassy. Simply choose which service you need, order online and post your documents to our office. We aim to complete all Kuwait orders in a quick time at the best price. Processing time 6-8 days for most documents. UK businesses submitting documents to Kuwait will be asked to get the documents attested at the Kuwait Embassy. Any documents relating to a UK company must be issued with the apostille, stamped by the Arab Chamber and finally attested by the embassy. There is no fast track option and you cannot simply send documents to the embassy. Handling every step of the process, we make your life easier. Our expert team will ensure your documents are processed correctly. When ordering Kuwait attestation for business documents please provide photocopies of all documents. Processing time 10-12 days for most orders. 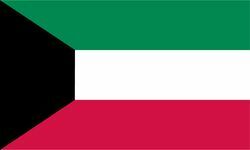 What does the Kuwait attestation look like? 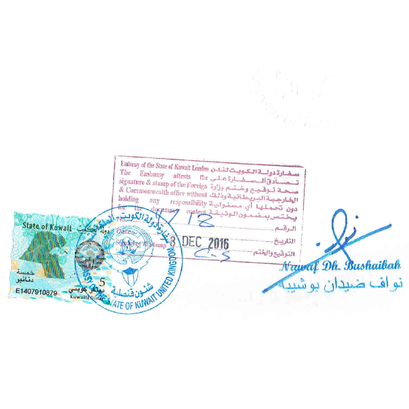 In addition to the apostille certificate, the Kuwait embassy will add several ink stamps and attach a sticker to your document. They also sign and date the document. Most of the stamps are applied to the back of documents and are either applied directly to the document or to the apostille certificate. Business documents will also be stamped by the Arab Chamber.